Tatiana Golovin (Russian: Татья́на Голови́на, tr. 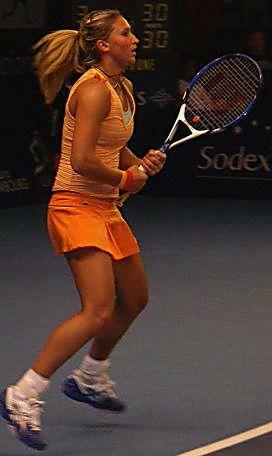 Tatyana Golovina; born 25 January 1988) is a former Russian-born French professional tennis player. She won the 2004 French Open mixed doubles event with Richard Gasquet, and reached the singles quarterfinal at the 2006 US Open, losing to the eventual champion Maria Sharapova. Her highest singles ranking to date is 12. In 2008 she was diagnosed with lower back inflammation and was forced to stop playing competitive tennis indefinitely. Golovin was born in Moscow, and spent six years at Nick Bollettieri's tennis camp in Bradenton, Florida. In the latter part of her career she was coached by former World No. 1 Mats Wilander, having previously been coached by Brad Gilbert and Dean Goldfine. Golovin made her ITF Circuit debut at Cagnes-sur-Mer (France) in 2002. She played in three more ITF events (including one semifinal) later that year, but she failed to qualify for the French Open. In 2003, Golovin won her first WTA Tour main draw match at Indian Wells against No. 146 Gisela Dulko (losing in the second round to Italian Francesca Schiavone). Golovin lost in the first round at Miami, Strasbourg and Roland Garros. She also played in four ITF Circuit events. At the Australian Open, Golovin (as No. 354, with wild card) upset No. 14 seed Anna Smashnova in the second round and No. 23 seed Lina Krasnoroutskaya in the third round (on her 16th birthday), before falling to No. 25 seed Lisa Raymond in the fourth round. It was just her second Grand Slam tournament and fifth Tour event she entered, and afterwards, on February 2, she rose to No. 136 in the WTA ranking. At Roland Garros, Golovin won the mixed doubles trophy with Richard Gasquet, as a Wild Card team, defeating Cara Black/Wayne Black. They became the youngest champions in 23 years (16 for Golovin, 17 for Gasquet). At Wimbledon, she reached the fourth round, with wins over Alina Jidkova, Francesca Schiavone, and Emmanuelle Gagliardi, before falling to World No. 10 Serena Williams. Golovin reached the semifinal at the Paris Indoors, losing to Mary Pierce, after beating world No. 10 Elena Dementieva in the quarterfinal for her first Top 10 win. In her first Tour grass court main draw at Birmingham, Golovin reached her first Tour singles final, which she lost to Maria Sharapova in 3 sets. Golovin reached her first Tier I quarterfinal in Montreal at the Rogers Cup, losing to Vera Zvonareva. Afterwards, she also reached the quarterfinal in Luxembourg, losing to eventual champion Alicia Molik. Golovin was a member of the France Fed Cup team, that defeated Italy in the quarterfinal and Spain in the semifinal, before falling to Russia in the final, in which she defeated No. 5 Svetlana Kuznetsova. During the year, she debuted in the Top 100 on February 16 (at No. 91), and in the Top 50 on June 14 (at No.50). Aged 17 years and eight months, Golovin reached the final in Tokyo at the Japan Open as No. 3 seed, losing to No. 2 seed Nicole Vaidišová, aged 16 years and five months. Golovin retired with a left achilles tendinitis, trailing 7–6(4) 3–2. She was also five-time semifinalist on four different surfaces: on hardcourt at Gold Coast, losing to Schnyder in 3 sets and later that year again on hardcourt at Seoul, losing to Jelena Janković in three sets; on carpet at Paris Indoors, which was her second straight semifinalthere, losing the third set tie-break against Dinara Safina; clay at Charleston, where she secured her third career Top 10 victory versus No. 8 Venus Williams en route to her first Tier I semifinal, before falling to Justine Henin-Hardenne in 2 sets; and grass at Birmingham, losing to Maria Sharapova. Golovin also reached the quarterfinal at Linz losing to Ana Ivanovic. She achieved a career-best performance at Roland Garros, reaching the third round as No. 17 seed, before falling to No. 12 seed Elena Bovina, and reaching an equal-best performance at the US Open, losing as No. 23 seed in the third round to No. 15 seed Nathalie Dechy in three sets. Golovin also made back-to-back fourth round appearances at Tier I hardcourt events in Indian Wells and Miami, losing to No.5 Elena Dementieva in three sets at both events. She made her Top 20 debut (at No. 18) after her semi-final appearance at Charleston. At her first tournament of the year in Gold Coast, Golovin reached the quarterfinal, losing to finalist Flavia Pennetta in three sets. She then lost in the first round of the Australian Open to Italian Mara Santangelo. Golovin reached her third consecutive Paris Indoors semifinal, defeating Nadia Petrova in the quarterfinals. The victory over world No. 7 Petrova was the fourth top 10 win of her career. She then lost to top seed and eventual champion Amélie Mauresmo. Golovin reached her second career Tier I semifinal at Miami, where she defeated world No. 8 Elena Dementieva in the fourth round for her fifth career top 10 victory and 100th career singles match win. In the semifinal, Golovin overcame a 5–1 deficit and four match points while down 5–3 in second set versus Maria Sharapova, pushing the match to a third set before she sprained her left ankle and retired at 3–6 7–6(5) 3–4. She made her return to the WTA Tour at Roland Garros, falling in the first round to Zheng Jie. Golovin went 2–1 in France's 3–2 Fed Cup World Group I Play-off victory over the Czech Republic. Golovin's third semifinal of the season was at Stanford, where as an unseeded player, she upset Ai Sugiyama and Anna-Lena Grönefeld on the way to losing to No. 2 seed Patty Schnyder. Golovin then reached the quarterfinal of the US Open, defeating Nadia Petrova for the second time in 2006 in the third round and Anna Chakvetadze in the fourth. She then lost to No. 3 seed and eventual champion Maria Sharapova. After a first round exit in Luxembourg following the U.S. Open, Golovin reached her first final since the Japan Open Tennis Championships in 2005 at the Porsche Tennis Grand Prix in Stuttgart by defeating Elena Likhovtseva in the first round, Iveta Benešová in the second, Michaëlla Krajicek in the quarterfinal, and 5th seed Patty Schnyder in the semifinal. Golovin then lost to Nadia Petrova in the final. Golovin started 2007 at the Hopman Cup in Perth, Australia, a non-Tour event. She won her first singles match, defeating American Ashley Harkleroad. She pulled out of the mixed doubles match with partner Jérôme Haehnel, citing an ankle injury. She then defeated Australian Alicia Molik, but then lost to Russian Nadia Petrova. Her first event of the WTA season was the Medibank International held in Sydney. In the first round, she beat Peng Shuai before falling to the top seed Amélie Mauresmo in the second round. At the Australian Open Golovin fell in the third round to 16th seed Shahar Pe'er in a three-hour match. Her next event was the Paris Indoors, where she lost in the third round to Justine Henin, who was playing her first tournament since her divorce. At the 2007 Proximus Diamond Games held in Antwerp, she beat Katarina Srebotnik, fifth seed Patty Schnyder and Elena Likhovtseva en route to the semifinals, where she lost to Belgian Kim Clijsters. In the Tier I Indian Wells, Golovin was the thirteenth seed. In the first round, she beat Aiko Nakamura, and then defeated Samantha Stosur. During her fourth round match-up against Nadia Petrova, the Russian retired, allowing Golovin to set up a quarterfinal match-up with surprise quarterfinalist Sybille Bammer. Golovin was the heavy favourite for this match, but she lost this match. On April 8, 2007, Golovin won her first WTA title at the Bausch & Lomb Championships in Amelia Island, Florida, defeating Nadia Petrova on green clay. At Wimbledon, Golovin lost in the second round to 16-year-old, unseeded Tamira Paszek. This was considered to be a major upset. Golovin attracted attention from the media and Wimbledon officials by wearing bright red undergarments – prompting a check of the "predominantly white" rule. At the Acura Classic in California, she lost to top seed Sharapova in the third round. Golovin returned to action at the Rogers Cup in Toronto, Canada where she reached the semifinals, eventually losing to Jelena Janković. She entered the 2007 US Open Women's Singles event as the No. 17 seed, but was upset in the first round by American wildcard Ahsha Rolle. Later that year, Golovin went on to win her second career title in Portorož, defeating home favourite Katarina Srebotnik in the final. She then competed in the Porsche Tennis Grand Prix, a tournament that had eight of the world's top 10 players in the field. She equalled her previous year's finish, reaching the final before losing to Justine Henin. A fortnight later, Golovin had the chance to her avenge her loss to Henin at the 2007 Zürich Open. This was her first final in a Tier I tournament, however Henin defeated her once again. Golovin started the 2008 season representing France at the Hopman Cup in Perth, where the team was facing Taiwan, Serbia and Argentina in their group. Golovin was victorious in singles, winning all of her matches. She had partnered Arnaud Clément for the doubles matches, and the team had a 2–1 record there. As a result, France finished second overall. Her next event was the Tier II tournament in Sydney, where she beat Tzipi Obziler to advance to round two. However, she was defeated by Jelena Janković, whom she had beaten by retirement just a week ago at the Hopman Cup. Golovin entered the 2008 Australian Open as the No. 13 seed, her highest ever seeding in a grand slam. She got past compatriot Stéphanie Cohen-Aloro in her opener, but lost in the second round to another fellow French player, Aravane Rezaï. Golovin was then scheduled to represent France in the Fed Cup team competition versus China before going on to defend her semi-final points in Antwerp. However, due to yet another injury for Golovin, this time to her back, she was forced to pull out of both competitions. A small consolation in this time period was the fact that, due to Nadia Petrova failing to defend her title at Paris in 2007, she climbed a spot to a career high ranking of 12. Golovin entered the WTA Tier III Memphis tournament in March. However she lost in the first round to Bethanie Mattek. Then in April, she competed on the ITF $100k Cagnes-sur-Mer tournament, but ended up falling in the second round to Maret Ani. Next she suffered another early exit in May, losing in the first round of the WTA Tier II Berlin tournament to Caroline Wozniacki. At the 2008 Beijing Olympics, she had partnered with Pauline Parmentier, but the team had to withdraw due to Golovin's back injury. After missing a total of four successive months due to medical concerns with her back, she eventually pulled out of the 2008 U.S. Open. She was diagnosed with lower back inflammation and was forced to stop playing competitive tennis indefinitely. She appeared in the 2009 Sports Illustrated Swimsuit Edition alongside Daniela Hantuchová and Maria Kirilenko in a pictoral entitled Volley of the Dolls. As of 2013, Golovin is still retired from professional tennis. She has forged a career in broadcasting, working for French television. To prevent confusion and double counting, information in this table is updated only after a tournament or the player's participation in the tournament has concluded. This table is current through to the Australian Open tournament, where she lost on January 16, 2008. Golovin was born in Moscow but moved to Paris with her parents when she was eight months old, and attained French citizenship. She speaks fluent French, English and Russian. Golovin has two sisters, Olga and Oxana. She was in a relationship with Manchester City footballer Samir Nasri; it is alleged that they broke up in 2012. ^ "Sharapova survives after Golovin injury; Roddick ousted at Nasdaq". USA Today. 31 March 2006. Retrieved 3 July 2011. ^ "Golovin wins first WTA title at Bausch & Lomb". ESPN. 8 April 2007. Retrieved 3 July 2011. ^ "Golovin out of Olympics". Skysports.com. 9 August 2008. Retrieved 3 July 2011. ^ a b Bishop, Greg (June 5, 2012). "Retired at 24, Tatiana Golovin Has Press Box View of French Open". The New York Times. ^ The Sun, No wonder they let Flamini go, by Vikki Orvice, 12 July 2008. ^ The Independent, Samir Nasri: Gunners midfielder is streets ahead, 19 February 2009. ^ Yahoo news, Samir Nasri's new off-pitch distraction and Barcelona stars go shopping,by Ash Hashim, 16 February 2013. ^ "Peace and Sport". Peace-sport.org. Retrieved 3 July 2011. On March 22, 2015, she announced that she was expecting a child with her partner, French rugby player Hugo Bonneval. She also works for French television, as a tennis commentator.